As a member of the big Mac league, if you regret that the compelling MediaCoder passionately opens arms to Windows users while shutting the door against Mac users. Occasionally, you feel envious to Windows users that they can free utilize such a comprehensive tool for file transcoding and compression. It's quite understandable to your mood. Luckily, currently you have no occasion to envy on them, for there comes a better choice for you-MacX Video Converter Pro to do you a good turn. Every barber knows that MediaCoder, named as "Swiss army knife" by its developer, beats the pants off other Windows transcoders when it comes to its mighty compression and transcoding feature. Well, for Mac operating system, MacX Video Converter Pro captures the utter dominance over other competitors partly rooted in its remarkable file format conversion and transcoding function for Mac users. 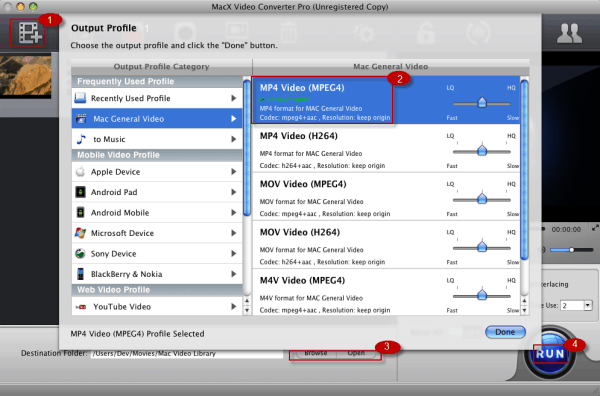 As a result, MacX Video Converter Pro is regarded as the best video transcoder for Mac. MacX Video Converter Pro, the multifunctional yet next ideal MediaCoder for Mac alternative is adept at converting almost all the video and audio formats. Elaborately, it's capable to convert any video to over 180 video formats and 14 popular audio formats on Mac (El Capitan), such as M2TS to MP4, MKV to AVI,WMV to MOV, FLV to AVI, AVCHD to MOV, MP4 to MP3, etc as eye as rolling off a log thanks to its innate 320+ video and 50+ audio codecs. Another extraordinary point is that no matter you are inclined to convert multi-track HD videos M2TS (Blu-ray), MTS, TS, AVCHD, MKV to MP4, MOV, etc. popular SD video format, upload your HD video to YouTube, Metacafe, or transfer video to iPad, iPone, Samsung, HTC handheld devices for sharing, this admirable tool can efficiently handle them. It's the very cup of your tea. Best alternative to MediaCoder to convert videos to MP4, MOV, M4V, MP3, etc for playback on iPhone 6S/6S Plus/6/6 Plus/5S/C, iPad mini 4/Air 2/Pro, Android with world's No.1 fast speed & no quality loss. Free download top 1 alternative to MediaCoder on Mac OS and launch it, click "Add File" button and locate the video files which you want to convert. Step 2: Choose "to MP4" as the Output Format. Here we choose MP4 as output format from the format list. You can also choose different formats grounded on your demands in this ultimate MediaCoder alternative for Mac. Click the "RUN" button to start conversion, then this fabulous MediaCoder for Mac alternative will take care of the rest for you. Tips: It also acts as a superexcellent program to download HD Ultra HD YouTube videos and convert YouTube video to large volume of formats, YouTube video to MOV, MP4, AVI, AVCHD, TS, MTS, MKV and so on. Additionally, for those of you who yearn for recording on-screen video like game walkthrough or non-downloadable videos for offline enjoyment, it's also your beat choice. Here is a list of the top free Mac video converter for you to convert among HD and SD videos on Mac OS, like MKV to AVI, AVCHD to MOV, AVI to MP4 etc; and convert video to your iPhone, iPod, iPad and more handheld gadgets. This article shares with you how to download KeepVid alternative for Mac to enjoy online videos on Mac.